This open floor plan home has plenty of room for the whole family (or two)! The master bedroom is a stunning oasis with a wall of windows facing the main channel. Enjoy coffee from the keurig on your own private deck. Down the hall a bedroom with a queen size bed, guest bathroom and a bunk room face the open family room with floor to ceiling two-story windows with main channel views! Downstairs, another private bedroom with a King-sized bed faces the lake. A full size washer and dryer are available for your use. A fully-stocked kitchen features an additional ice maker, and two refrigerators are available on the main level. Relax on the large sectional sofa and watch boats pass by on the lake, or step outside on the patio to grill, have dinner, or lounge in the sun. There are only a few steps down to the rock fire pit or your own personal two-well dock! The main level TV and family room also features a pull-out couch and a whole home audio system. This lakefront home with tons of character is sure to be the highlight of your vacation at the lake! We are native Missourians and huge Tiger fans! We enjoy visiting the lake as a fun getaway close to home during all seasons of the year. We hope you enjoy our home as much as we do! Our home has amazing main channel views indoors and out, the ability to watch Tan-Tar-A's fireworks, and is in a quiet neighborhood close to restaurants and entertainment by both water and car. With your own two-well dock, lakeside fire pit, serene patio and wall of windows indoors, there is an abundance of activities within and outside our home that all can enjoy! Two bedrooms and the living room have lake views. The home is lakefront. 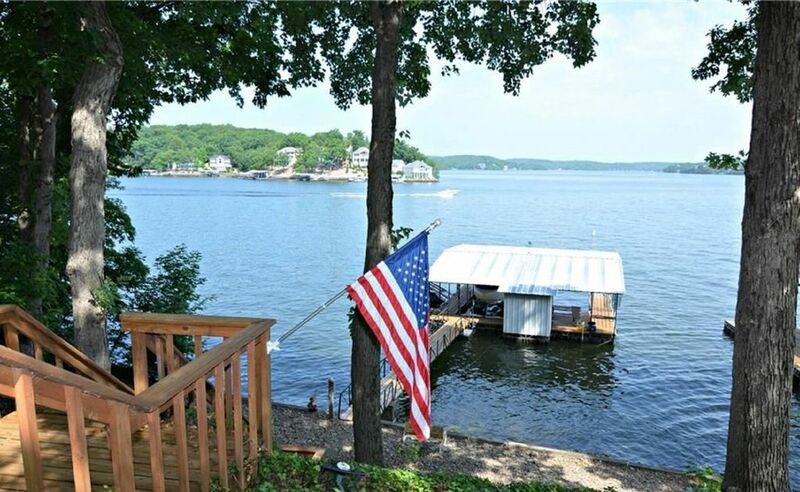 This house is located on the water at the 26MM of Lake of the Ozarks. It is across the main channel from Tan-Tar-A (soon to be Margaritaville) Resort. Two refrigerators are available on the main level. There is a separate ice maker as well. Two Keurig coffee makers, one drip coffee station. Coffee for the drip coffee maker, paper towels, salt, pepper, etc. Some dvds available - Netflix is available on all televisions. We had an awesome Labor Day weekend at your home. The views from the patio and the interior wall of the windows were fabulous! The views and location of this house were outstanding. It is also convient to Woods grocery store and lunch at Papa Chubby’s. The house was clean and had everything we needed to make our stay comfortable. The beds were very comfortable and the towels and sheets were extra soft. We loved the master bedroom sitting area where we enjoyed our morning coffee while watching the hummingbirds at the feeder. Not to mention all the wild life we saw from deers to wild turkeys and an armadillo. However, we mostly enjoyed swimming and relaxing off the boat dock. Loved having the picnic table and chairs to fully enjoy the lake. The Lilly pad was great too! All that being said, the icing on the cake was the fantastic fireworks display we got to see right from the dock. Tan Tara put on an amazing Labor Day display! Loved staying at your home! Fresh, clean, soft linens/towels made it very comfy.